After the honeymoon was over (at least our part of Liz and Brandon’s honeymoon anyway), we stayed in Cook’s Bay to wait for the Tahiti-Moorea Sailing Rendevous to catch up to us. 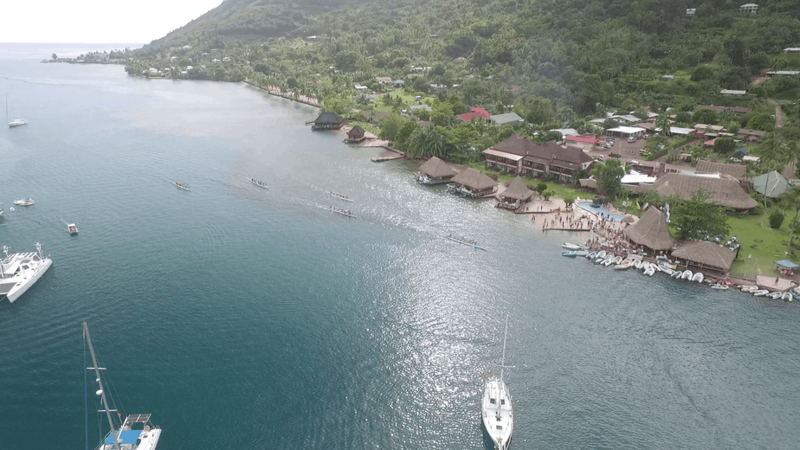 The Tahiti-Moorea Sailing Rendevous is the final event of the Pacific Puddle Jump. 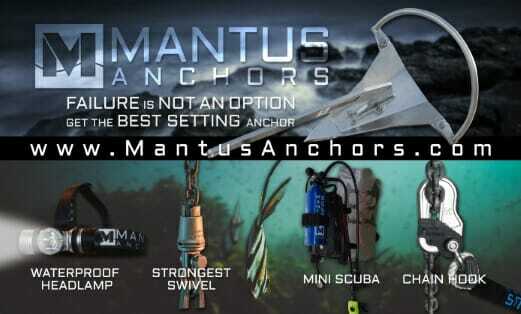 The first events were back in Mexico or Panama, an introduction to sailing the South Pacific. The Pacific Puddle Jump is a loose organization of the sailboats crossing the Pacific Ocean, sponsored by Latitude 38. The sailing part of the Tahiti-Moorea Sailing Rendevous started in Tahiti at 10:30, so we watched as the boats filtered in throughout the morning. Again, this was a lot of boats that we knew already; SwiftSure, Margansie, Blue Raven, Carthago, etc. Also, some cruisers we knew hitched a ride on other boats and left their boat in Tahiti, such as Blowin Bubbles and Beachhouse. 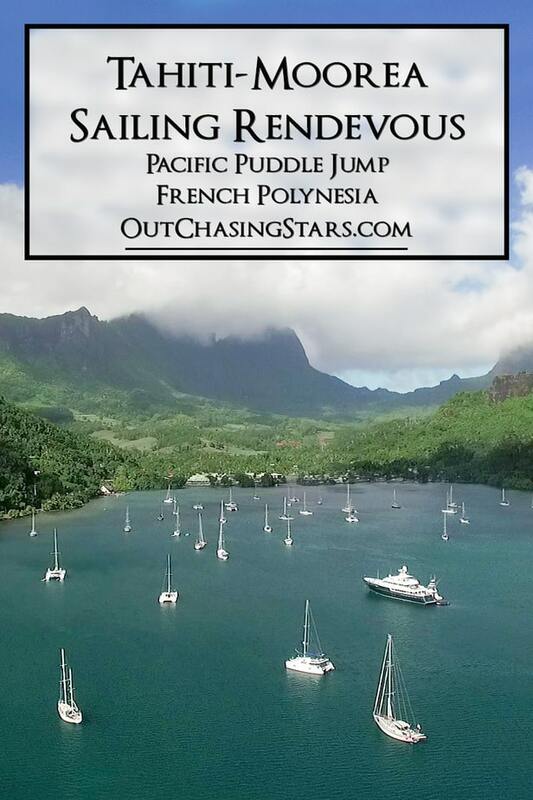 Also, many people used the ease of traveling in and out of Tahiti and the celebration as a good time to have friends and family visit. We got to meet friends and family members of our cruising buddies. There were about 150 people attending the event. At five we headed into the Bali Hai hotel for cocktails and entertainment. 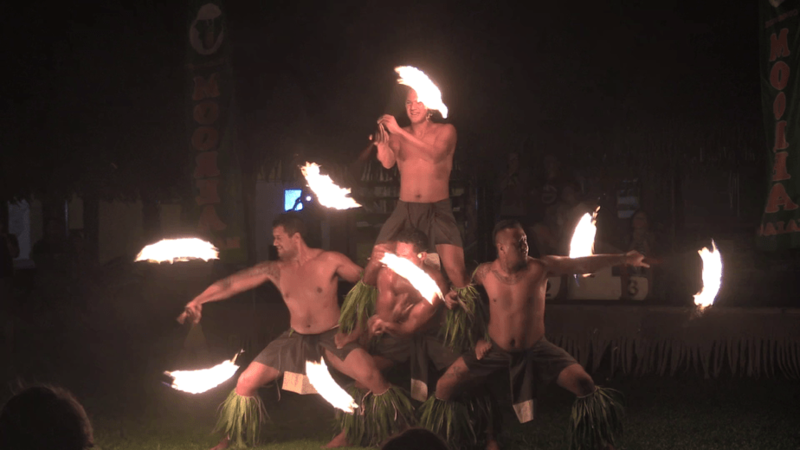 There was an hour or so of mingling and socializing, and then partner companies gave presentations – marinas in Fiji, New Zealand, and Australia. We picked up materials to read later – all these places seem so far away right now, we barely have a detailed plan a few days in advance. After the presentation, the entertainment started up and we all sat for dinner. I think the show was the same entertainers we watched Friday night with Liz and Brandon, but the show was bigger and included fire dancing. 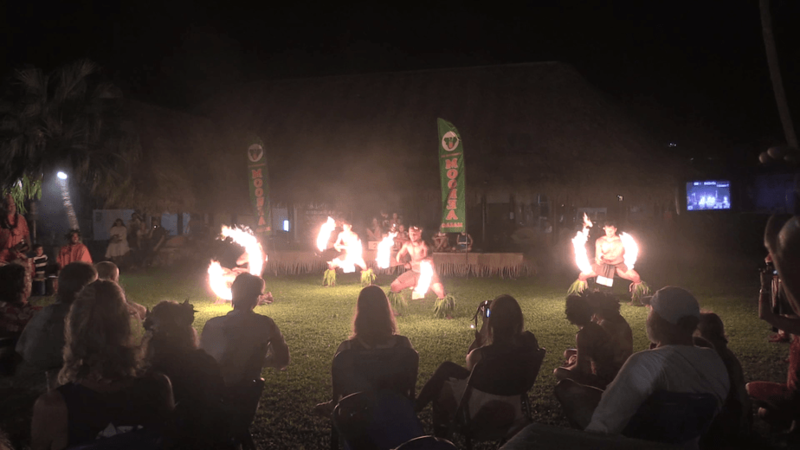 To see this show twice was pretty great, considering you have to pay $110 per person to go see the show and dinner at the Tiki Village on Moorea. The meal was a house of steak or fish. I had the fish and David had the steak. Some people at our table ordered the steak, which came out way too underdone so they sent the steaks back. A few tables complained about poor service, like not getting their food, but David and I were both lucky and enjoyed the meal. I advised the organizers to stick with the buffet. The next morning (Sunday) we headed to shore in the morning for the outrigger races. Cruisers had made 35 teams of four to race outriggers. With five boats and a collection of about 20 experienced paddlers, each canoe had two locals (one coxswain and one in front) with us. We named our team Greek Tragedy, and it consisted of me with the crew of Margansie. There were seven initial heats. We lost but enjoyed cheering our friends on and David got Phoenix up to take video. After the seven heats, there were three semi-finals, a kids’ run, and then the finals. Some of the boats were surprisingly good. 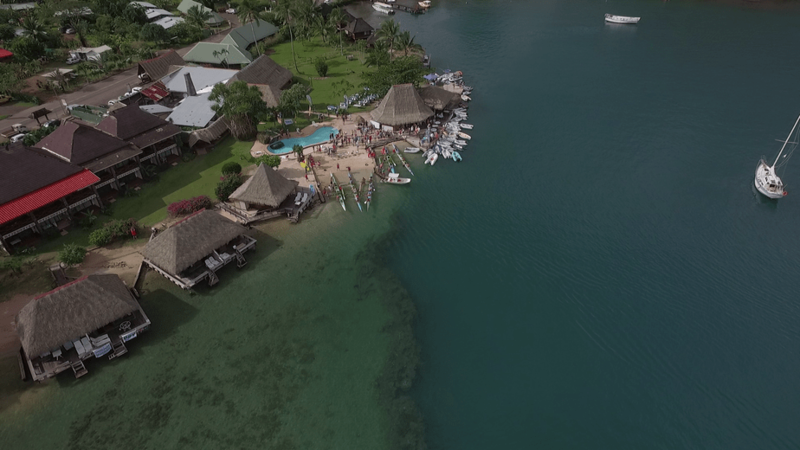 One family (two adults and two boys) have apparently spent the last year here in French Polynesia and have taken to paddling an outrigger together very often. It was amazing to watch the coordination they had. After the races we had lunch. The Bali Hai Hotel served dinner buffet-style and billed it as a Polynesian menu. I loved it! There was veal, pork, and chicken, plus Polynesian poisson cru, poisson cru chinoise (Chinese), sashimi, potato salad, rice, and a green salad. I really enjoyed the poisson cru chinoise, and now I’ve found a recipe for it to try at home. They also served a dessert, something with a firm jelly consistency. It was also quite tasty. After lunch, David and I were feeling pretty maxed out. It had been a busy two weeks, so we went back to Starry Horizons for a nap. The rest of the cruisers enjoyed dance lessons and coconut husking lessons. After things broke up, we had some friends over for cocktails: Carthago, Blue Raven, and Nauti Nauti. 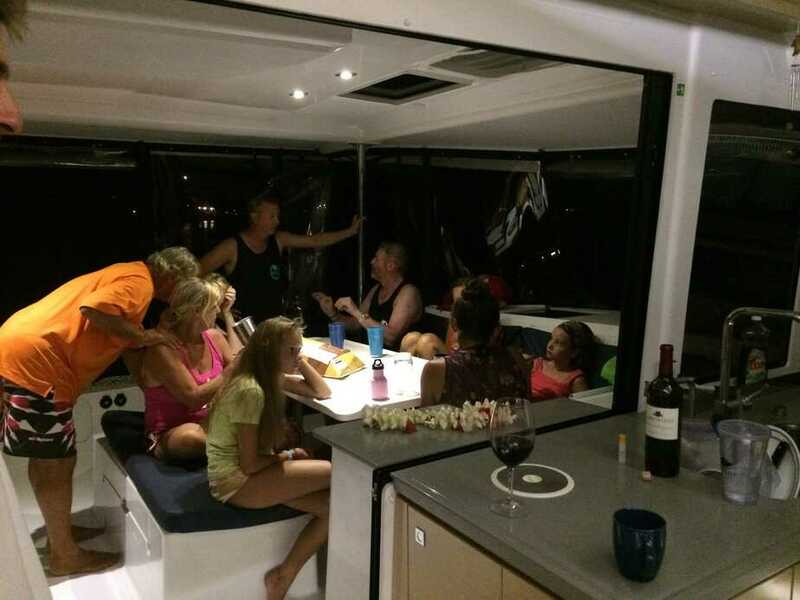 Several boats had guests visiting, so in total, we had 13 people on board. Monday we spent quietly doing chores and running errands, in addition to saying goodbye to the boats headed out. 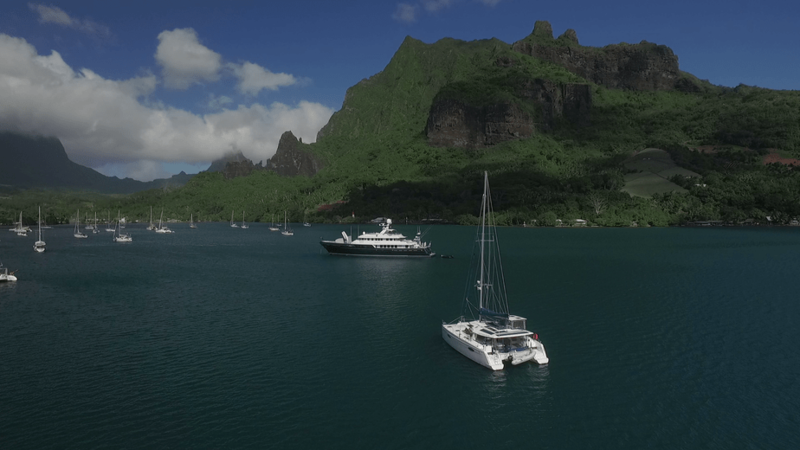 Many boats seemed to head to Opunohu Bay or back to Tahiti. 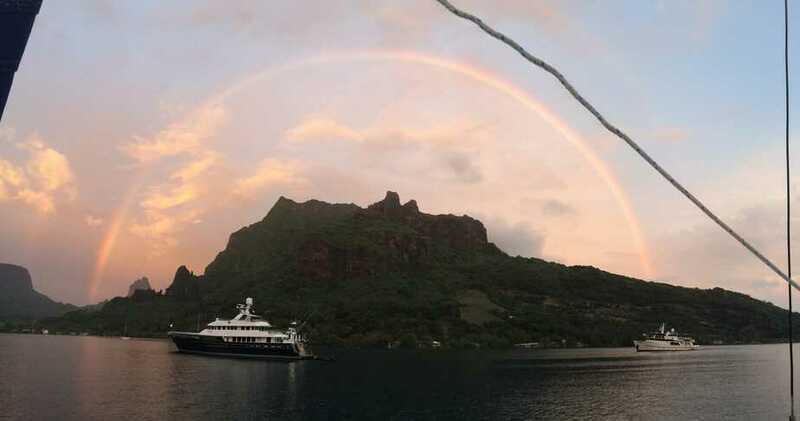 We had a blast at the Tahiti-Moorea Sailing Rendevous. 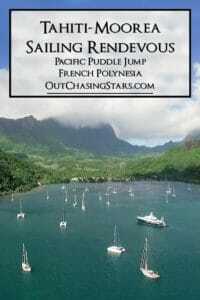 Tuesday we departed after sunset to head to the island Huahine, about 80 nm away. You have a positive attitude and open mind, that’s why you enjoy everything!